Nine words that gave me a real wake-up call in my life were: The way to brain health is through the gut. As a professional who is dedicated to helping children experiencing difficulties in school, I had long felt that there was a piece missing from the puzzle. This was the missing link! These and other behaviours are the symptoms that so many children show. The trouble with these symptoms is that they don’t explain what is causing them. It’s rather like an iceberg – one sees the tip of the iceberg rising above the sea level but we are seldom aware of the size and complexity of the mass of ice floating below. Remember that only 7% of an iceberg shows above the water – the greater mass is hidden. ILT is concerned with the underlying causes of such behaviours. Unlike therapists and practitioners who follow the ‘medical model’, we don’t try to find a diagnosis to ‘fit’ the symptoms. This merely results in labelling a child with what is usually a mental disorder or learning disability, such as ADHD, Dyslexia, Auditory Processing Disorder, Dyspraxia and so on. These labels tell us very little about the underlying cause of that behaviour. To us, it seems far more sensible to rather unravel the reasons for the child’s inability to thrive in school. In order to do so, we have to play the role of detective, looking for clues that point us in the right direction to help a child without resorting to medical prescriptions for medications or trying to control the symptoms through behaviour modification strategies. Some people find it difficult to believe that the lists of symptoms above are very often related to food intolerances and/or poor gut health. There is, however, a dawning realisation that the brain is dependent on the health of the digestive system for efficient functioning. I say dawning because while the study of the gut biome (the number and quality of the ‘good’ bacteria in the gut) and its relationship to health and disease is an exploding area of research , too often the role of the digestive system is overlooked when adults and children present with anything concerning the brain. Fortunately, that seems to be correcting and there are increasing numbers of doctors that are making it their business to understand the connection between the digestive system and the brain. The brain is directly affected by the food we eat, air we breathe, and manner in which we treat our bodies . Virtually every child who shows symptoms of ADHD and other labelled disorders presents with evidence of a disturbed brain-behaviour relationship. Whether hyperactivity or inattentiveness or any other symptom is caused by nutritional deficiencies, too many refined sugars and other carbohydrates, food additives, prescribed medications or interferences in brain development, the way the brain functions often provides the clue to the answer. Behaviour is the response to the chemical signals received by the brain. Our work is to try and unravel the cause that is triggering the brain to respond to those chemical messages by instructing the body to perform the observed behaviours. Behaviours are an important clue to how the body and brain are functioning. They are the symptom, not the cause. There is a reason why so many children who present with learning and behaviour challenges also experience allergies, eczema, decided food preferences (are ‘picky eaters’) and tend to be susceptible to illnesses. Such children may have less than adequate immune systems – 60% of which is said to be located in the gut. Amy Myers, a medical doctor specialising in the field of Functional Medicine, believes that ADHD is an auto-immune disease caused by inadequate diet and imbalances in the gut. The reason behind her belief is that so many children with the label of ADHD have what medical people term Gastro-Intestinal (GI) dysfunction. 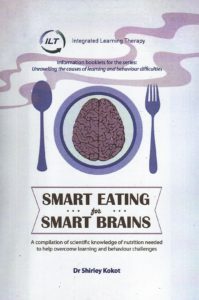 More about this important role of nutrition is available in Smart Food for Smart Brains. It is available from ILT so contact us to purchase it.